Knowing how to code is becoming an increasingly important skill for many different fields of expertise. Software is everywhere: in our cars, telephones, books and even refrigerators. While learning to code is not a magic bullet to land the perfect job, it can nevertheless be an great asset in many different situations. Especially for people who are doing business online in any way, shape or form, coding is a skill as essential as reading and writing. Whether you’re selling handicrafts, teaching online or writing books, learning how to code might be what it takes to set you apart from the competition. The great thing about these platforms is that it lowers the entry-barriers. Anyone can participate. But it’s always the platform that has the last say regarding everything from user-interface to commission payments. In the end, each website or platform is built from the same stuff: code. By learning to code, you can build your own platforms. It doesn’t have to be the next Facebook or Amazon, but perhaps just a little website. Of course there are many already-existing platforms that promise to help you build a website “without coding” but it’s only so long before you’ve exhausted the set of pre-configured themes and options and come up against a wall which only coding will enable you to break through. First of all, there are many different programming languages, and just like with any other language, one should know why one is getting into it. At Codeacademy you can get a brief overview of and introduction to major programming languages for various fields, for free. 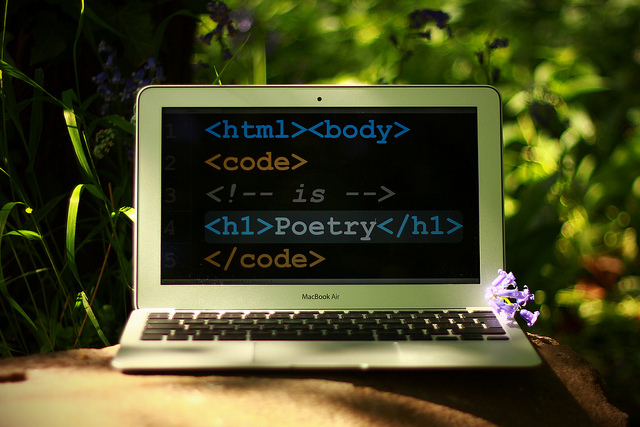 If you’ve never tinkered with code before, Codeacademy will help you to get your feet wet. It’s like Duolingo for programming: not perfect, but very easy to get started with. There are other free courses and introductions as well, like W3schools or A Beginner’s Guide to HTML & CSS and many others, but in the end it all depends on your personal learning preferences. The material (at least for beginners) will always be the same. Once you’ve learned a bit about the basics, it’s important to start applying your knowledge. One way of doing this is by looking at existing codes and getting a deeper understanding by tinkering with them. Sure, you’ll often break the code and render it unfunctional, but errors are one of the best ways of learning what makes a program tick. Codeacademy will supply you with some basic examples, but for more advanced things to tinker with, head on over to Codepen.io. See the Pen Some buttons… by Ottis Kelleghan (@cheeriottis) on CodePen. Can you change the colors or the size of the buttons? Go ahead and try it. Can you figure out how to increase the number of bubbles and/or change their color? Last but not least, try and find more examples of working code through Google. There are many forums and sites like stackexchange full of interesting threads with questions, answers and explanations. There are many great tutorials out there. One of my favorite sites for webdesign is codrops, for example. So the next time you’re not happy about what Facebook or any other platform is doing, don’t waste time ranting on your blog; build your own platform and projects instead!